See Ave, Imperator (above) for additional information. Per scientiam ad salutem publicam. Through knowledge to public health. Motto of Johns Hopkins School of Hygiene and Public Health, Baltimore, Maryland, USA. 1. Referring to a favorable activity that is good for one's health: George thinks that today is a salubrious time to go for a walk. 2. Relating to that which is wholesome and that promotes physical well-being: Fresh air is considered a salubrious condition for everyone. 3. 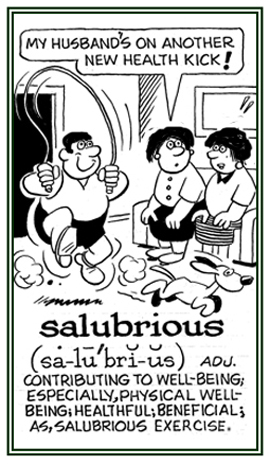 Etymology or origin: from Latin salubris, from salus, "health." © ALL rights are reserved. So as to promote health. The promotion of health or well-being, and wholesome and invigorating. Wholesomeness; healthfulness; favorableness to the preservation of health; such as, the salubrity of a country or climate. Translation: "The welfare of the world." Motto of the State of Missouri, USA. Cicero wrote in his De Legibus: Salus populi suprema est lex, "The welfare of the people is the supreme law." Where there are many advisers there is safety. 1. A description of something that is favorable or promotional to health; healthful. 2. Characteristics of some beneficial purpose; wholesome. 1. Referring to the promotion of physical well-being that is beneficial to one's health: Karen was always striving to have salutary meals for her family. 2. Characteristic of something of value or benefit to someone or something: The involvement of working with the refugees was certainly a salutary experience for Janice. 3. 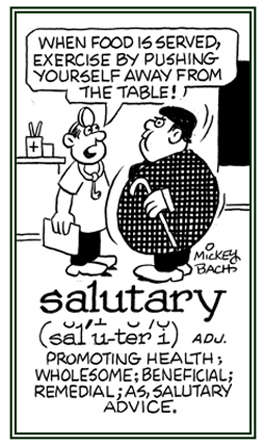 Etymology or origin: from Latin salutaris from salus, salut-, "health." © ALL rights are reserved. 1. A greeting which is written or spoken: People usually begin a letter with a salutation; such as, "Dear Margaret", "Dear Sir", "Dear Madam", or "To whom it may concern". 2. 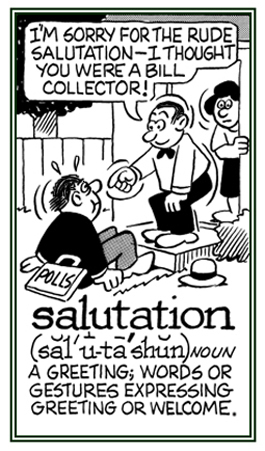 The act of acknowledging someone: A handshake and saying "hello" are well-known salutations used by many people. 3. 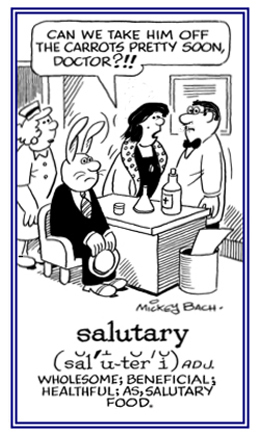 Etymology or origin: from Latin salutario[n] from salutare, "to pay one's respect to." © ALL rights are reserved. A greeter or someone who greets and pays formal morning calls. A person who gives the welcoming address at a graduation at a school, a college, or a university. Usually a speech given by the person with the second highest grade average in a particular graduating class. Related "health" word families and articles: Health: Index; Hygeia > hygiene > health; hygieio-, hygiei-; iatro-, -iatrician; sana-, sani-.